Welcome Home Series handle sets are the perfect addition to your front door to create a unique and fashionable entryway to your home. Each is stylishly designed to provide maximum-security protection. There are many styles, finishes and configurations from which to choose. Toluca's fashionable wave silhouette design is the perfect complement to homes with inspired style. This half-dummy, or trim function, is surface mounted on doors where only a pull is required. The complementary Antique Brass finish offers a warm feel with deep accents in the contours of the product. 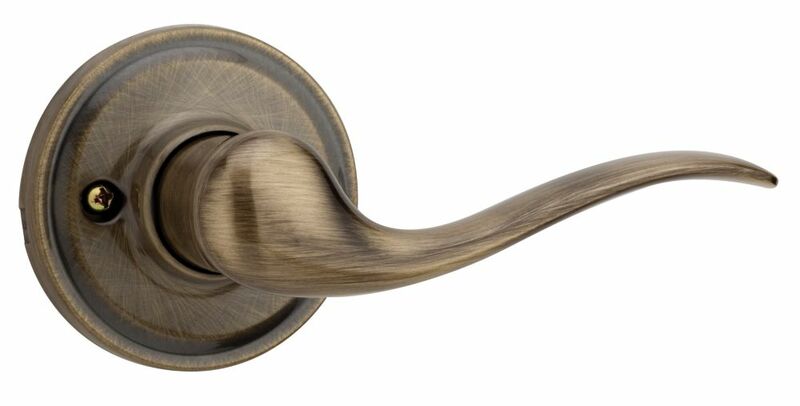 The Schlage Orbit Knob Bed and Bath Lock in Bright Brass is perfect for use on doors where locking is needed. The Orbit knob exemplifies minimalist style with its strong, spherical shape and uncomplicated design. When finished in Bright Brass, the knob takes on a warm golden sheen that adds a vintage appeal. Plus, it's been designed and tested with strength and durability in mind. Introducing Handleset Mix & Match by Weiser. The same Weiser simple and elegant style with the added benefit of chosing your own adventure. Amador has a refined, structural look with its simplistic modern design. Priced affordably, this handleset offers achievable style while maintaining superior security. Toluca Dummy Lever in Antique Brass Welcome Home Series handle sets are the perfect addition to your front door to create a unique and fashionable entryway to your home. Each is stylishly designed to provide maximum-security protection. There are many styles, finishes and configurations from which to choose. Toluca's fashionable wave silhouette design is the perfect complement to homes with inspired style. This half-dummy, or trim function, is surface mounted on doors where only a pull is required. The complementary Antique Brass finish offers a warm feel with deep accents in the contours of the product.